"Wolverine: Origins #25" Extremely Limited Edition Giclee on Canvas (28" x 39") by Simone Bianchi and Marvel Comics, Numbered Out of Only 4 Pieces and Hand Signed by Stan Lee (1922-2018). Includes Certificate of Authenticity. Custom Framed and Ready to Hang. 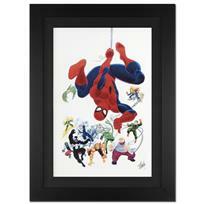 "Marvel Adventures: Super Heroes #10" Limited Edition Giclee on Canvas by Clayton Henry and Marvel Comics. Numbered and Hand Signed by Stan Lee (1922-2018). Includes Certificate of Authenticity. 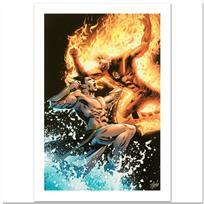 "Daredevil #500" Extremely Limited Edition Giclee on Canvas (36" x 22") by Marko Djurdjevic and Marvel Comics. Numbered Out of Only 10 Pieces and Hand Signed by Stan Lee (1922-2018). Includes Certificate of Authenticity. Custom Framed and Ready to Hang. 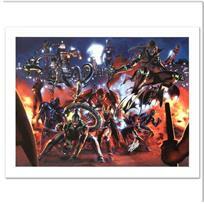 "Secret War #3" Limited Edition Giclee on Canvas by Gabriele Dell'Otto and Marvel Comics. Numbered and Hand Signed by Stan Lee (1922-2018). Includes Certificate of Authenticity. 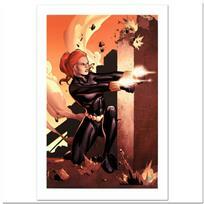 "Secret Avengers #13" Extremely Limited Edition Giclee on Canvas by Adi Granov and Marvel Comics. Numbered Out of Only 10 Pieces and Hand Signed by Stan Lee (1922-2018). Includes Certificate of Authenticity. Custom Framed and Ready to Hang. "Timestorm 2009/2099 #4" Limited Edition Giclee on Canvas by Tom Raney and Marvel Comics. Numbered and Hand Signed by Stan Lee (1922-2018). Includes Certificate of Authenticity. 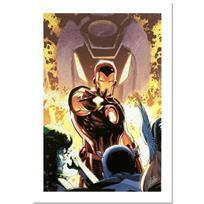 "Iron Age #1" Limited Edition Giclee on Canvas by Lee Weeks and Marvel Comics. Numbered Out of Only 10 Pieces and Hand Signed by Stan Lee (1922-2018). Includes Certificate of Authenticity. Custom Framed and Ready to Hang. "Avengers: X-Sanction #1" Extremely Limited Edition Giclee on Canvas by Ed McGuinness and Marvel Comics. Numbered Out of Only 4 Pieces and Hand Signed by Stan Lee (1922-2018). Includes Certificate of Authenticity. Custom Framed (40" x 29) and Ready to Hang. 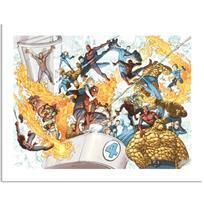 "Ultimate Fantastic Four #26" Limited Edition Giclee on Canvas by Greg Land and Marvel Comics. Numbered and Hand Signed by Stan Lee (1922-2018). Includes Certificate of Authenticity. "Magneto: Not a Hero #2" Limited Edition Giclee on Canvas by Daniel Acuna and Marvel Comics. Numbered and Hand Signed by Stan Lee (1922-2018). Includes Certificate of Authenticity. "Avengers #16" Extremely Limited Edition Giclee on Canvas (29" x 40") by Jerry Ordway and Marvel Comics. Numbered Out of Only 4 Pieces and Hand Signed by Stan Lee (1922-2018). Includes Certificate of Authenticity. Custom Framed and Ready to Hang. "Ultimate New Ultimates #5" Limited Edition Giclee on Canvas (26.5" x 37.5") by Frank Cho and Marvel Comics. Numbered 1 Out of Only 4 Pieces and Hand Signed by Stan Lee (1922-2018). Includes Certificate of Authenticity. Custom Framed and Ready to Hang. "Secret Invasion #4" Extremely Limited Edition Giclee on Canvas (29" x 40") by Gabriele Dell'Otto and Marvel Comics. Numbered Out of Only 4 Pieces and Hand Signed by Stan Lee (1922-2018). Includes Certificate of Authenticity. Custom Framed and Ready to Hang. "Captain America: The 1940s Newspaper Strip" Extremely Limited Edition Giclee on Canvas (25" x 34") by Butch Guice and Marvel Comics. Numbered Out of Only 10 Pieces and Hand Signed by Stan Lee (1922-2018). Includes Certificate of Authenticity. Custom Framed and Ready to Hang. "Fallen Son: Death of Captain America #5" Extremely Limited Edition Giclee on Canvas (35" x 28") by John Cassaday and Marvel Comics. Numbered Out of Only 4 Pieces and Hand Signed by Stan Lee (1922-2018). Includes Certificate of Authenticity. Custom Framed and Ready to Hang. 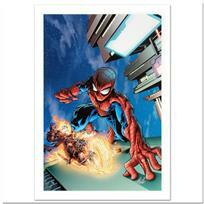 "Marvel Visionaries" Extremely Limited Edition Giclee (28.5" x 39.5") on Canvas by John Romita Sr. and Marvel Comics. Numbered Out of Only 4 Pieces and Hand Signed by Stan Lee (1922-2018). Includes Certificate of Authenticity. Custom Framed and Ready to Hang. "New Avengers #8" Extremely Limited Edition Giclee on Canvas by Steve McNiven and Marvel Comics, Numbered Out of Only 10 Pieces and Hand Signed by Stan Lee (1922-2018). Includes Certificate of Authenticity. Custom Framed and Ready to Hang.